Republican presidential hopeful Governor John Kasich speaks at a town hall event at the Fuyao Glass America plant in Moraine, Ohio on Friday evening. Introduced by his wife Karen, Kasich provided opening remarks and then entertained questions from the audience inside the former General Motors Moraine Assembly factory that appears to have been selected to tout his economic accomplishments during his nearly six years as Ohio's governor. Closed in December 2008 due to high fuel prices and the decreased demand for trucks and SUVs, the facility was purchased by China's Fuyao Glass Industry Group to produce automotive glass products for GM and other automakers. This 2014 acquisition was heavily influenced by a nearly $6 million grant provided by JobsOhio, a state economic development agency created by Kasich shortly after taking office in 2011. Nicknamed "the Happy Warrior" because of his positive messaging and an aversion to personally attack his opponents, he spent 45 minutes listing his accomplishments as governor and as a 9-term congressman who enjoys a reputation for cooperation and consensus-building. Prior to the Kasich's arrival, several local politicians and company officials provided their own remarks to support the state's top Republican official to include former Dayton mayor and current US representative Mike Turner. 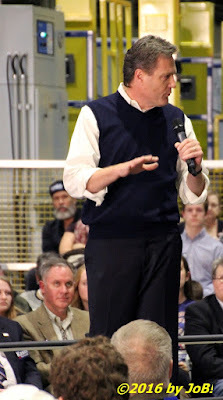 U.S. Representative Mike Turner delivers remarks awaiting the arrival of Governor John Kasich at a town hall event at the Fuyao Glass America plant in Moraine, Ohio on Friday evening. Although only leading in one recent poll, three others have him within striking distance of the GOP's current delegate leader, New York businessman Donald Trump. As a "winner-take-all" state, the candidate receiving the most votes walks away with all 66 delegates and 63 alternates in the race to reach the 1.237 total that secures them Republican Party's nomination. 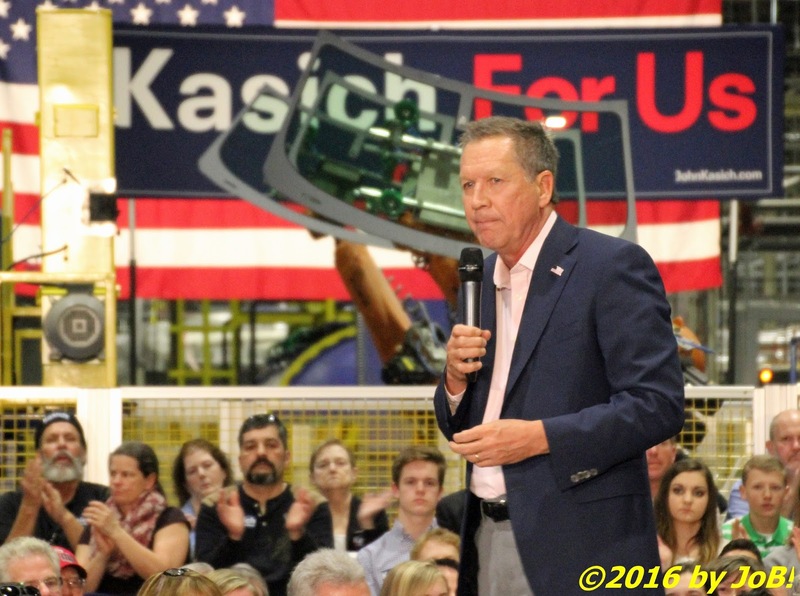 With the lowest total of the four remaining candidates, winning Ohio is crucial to Kasich's attempt to remain in the race and arrive at a potentially contentious brokered convention in Cleveland come late June to sell himself as the party's best bet at defeating Hillary Clinton, the Democrats' presumptive nominee. 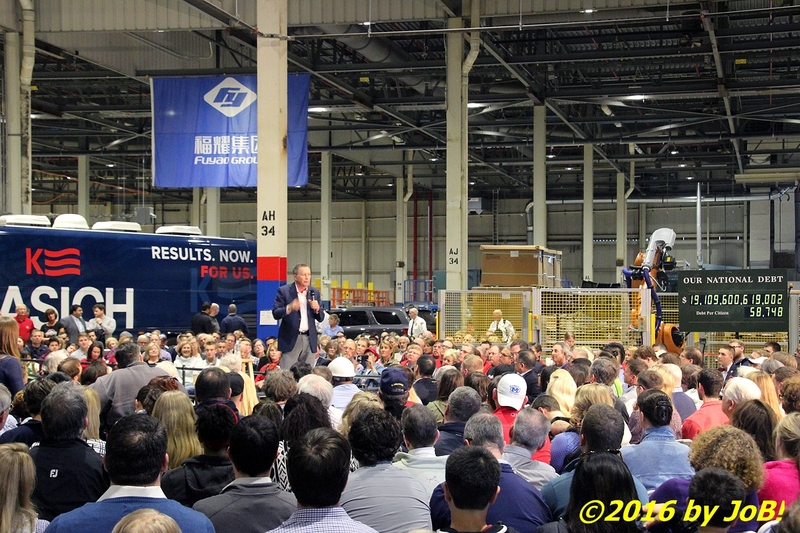 Ohio Governor John Kasich addresses the crowd near the end of his town hall event at the Fuyao Glass America plant in Moraine, Ohio on Friday evening. 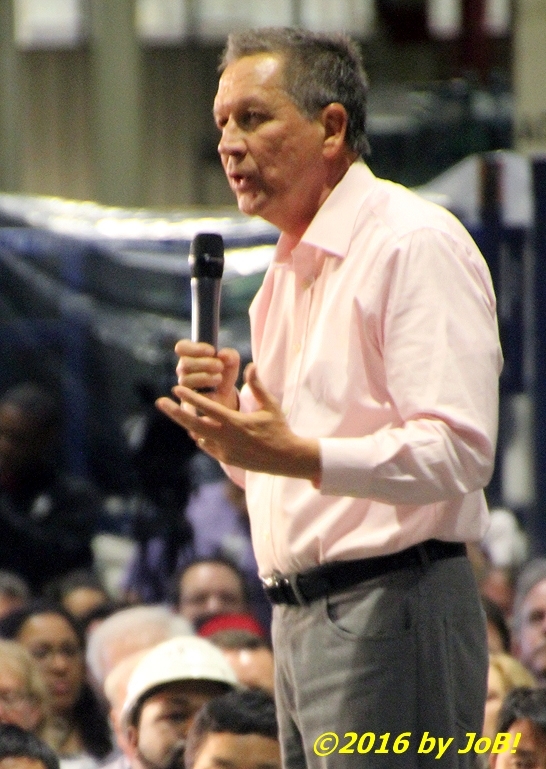 Kasich was the second high profile political visitor to come to the Dayton area in the past three days. On Wednesday evening, former president Bill Clinton spoke at the annual Montgomery County Democratic Party's Frolic for Funds dinner to advocate for his wife's campaign. On Saturday, Trump is scheduled to make a stop at the Wright Brothers Aero facility in Vandalia, adjacent to the Dayton International Airport and both Hillary Clinton and Vermont senator Bernie Sanders will be attending events in the Columbus area on Sunday in advance of Tuesday's primary election.